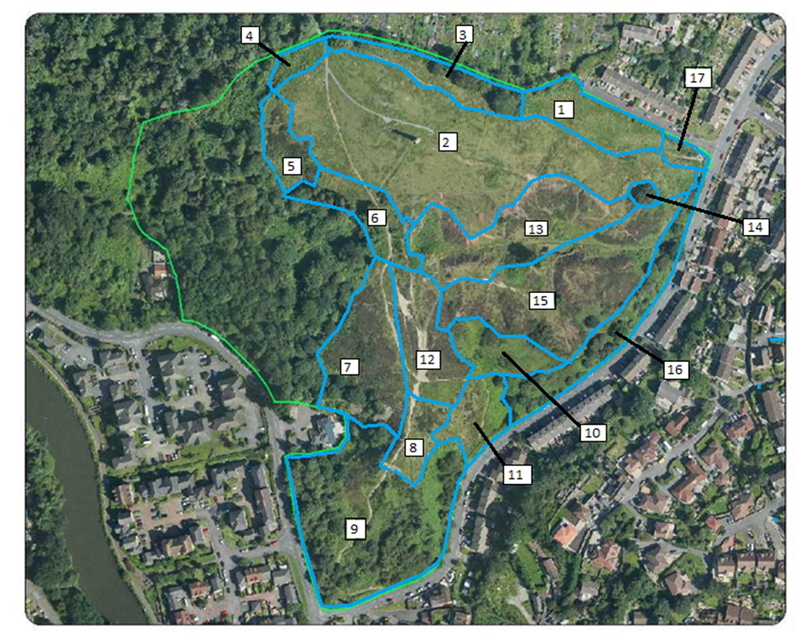 Troopers Hill is managed in accordance with a plan agreed between Bristol Parks and Friends of Troopers Hill. Thanks to National Lottery players we have funds to review and update the management plan and get advice on future habitat management as part of our Ways to Nature Project. The revised plan is now being finalised and you can see the latest draft via the links below. Following advice from Avon Wildlife Trust, the new plan covers a 10 year period. The overall aims and objectives remain unchanged from the earlier plans, but some of the detailed recommendations have changed. Also as part of our Ways to Nature Project, our National Lottery Heritage Fund grant is paying for some conservation work to be carried out over the winters of 2018/19 & 2019/20 based on the recommendations in the revised plan. This is work that is additional to the regular works carried out every winter by Bristol Parks and by Friends of Troopers Hill at our Conservation Work Parties. The work is being carried out by Green Mantle who are approved Bristol Parks contractors. We organised a Conservation Walk on Sun 16th Dec 2018 to talk about the plan and the habitat management works that we have commissioned. The plan for the period April 2012 to March 2017, is available via the link below. To enhance the use of the site for recreation by the local community while protecting its natural beauty, rich bio-diversity, history and geology. The most important habitat on Troopers Hill is the acidic grassland and heathland, this covers the central area of the site and is the core of the reserve and the reason it was created. Both acidic grassland and lowland heathland are UK priority habitats in the UK Biodiversity Action Plan (UK BAP) and together with other 'Species Rich Grasslands' their protection is also one of the aims of the Bristol Biodiversity Action Plan. The changes in the habitat on Troopers Hill have been monitored since 1994, through a regular photo survey and this provides good information on how the habitats are changing. Both the 2012 and 2007 Management Plans were put together with advice from Bristol Parks Natural Environment Team and other naturalists in Bristol. In 2007 all agreed that the priority is for this core habitat to be protected and where possible to be restored to areas where the surrounding scrub and woodland had encroached over the previous twenty or more years (Photographs of Troopers Hill in the 1960s). To achieve this aim it was necessary to remove some of the trees and scrub that had grown in that time, this work was was managed by Bristol Parks and carried out in the winter to avoid the bird nesting season. The work set out in the 2012 plan continues this principle, there are now few new areas of trees or scrub to clear, the priority is to prevent scrub from re-establishing in areas previously cleared. Areas of scrub are being maintained around the outside of the site but these are being managed to prevent them becoming woodland. Between the scrub and the grassland and heathland on some parts of the site are areas of broom. 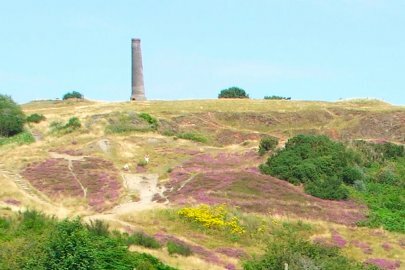 Troopers Hill is the only site in Bristol where broom grows in such profusion. As the hawthorn and bramble has been pushed back broom has re-established itself in some of these areas. However, the broom also needs to be controlled to avoid it spreading too much into the heathland. Some areas currently covered in broom will then be returned to grassland and heathland. This is a reversal of the natural progression that has occurred over the last 20 years where bramble has choked areas of broom and then hawthorn has grown amongst the bramble. The heathland is susceptable to fire in the summer, while this can lead to natural regeneration uncontrolled fires are a problem on such a small site in an urban area. 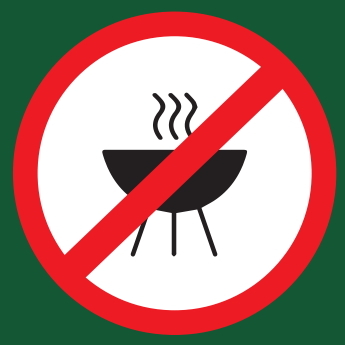 Barbecues are one cause of fires and Friends of Troopers Hill urged the Council over many years to introduce a byelaw to ban their use on the Hill. These byelaws were introduced in April 2017, see www.bristol.gov.uk/byelaws and our webpage explaining why this is necessary. Adjacent to Greendown there is richer soil and an area of grassland that needs an annual cut. 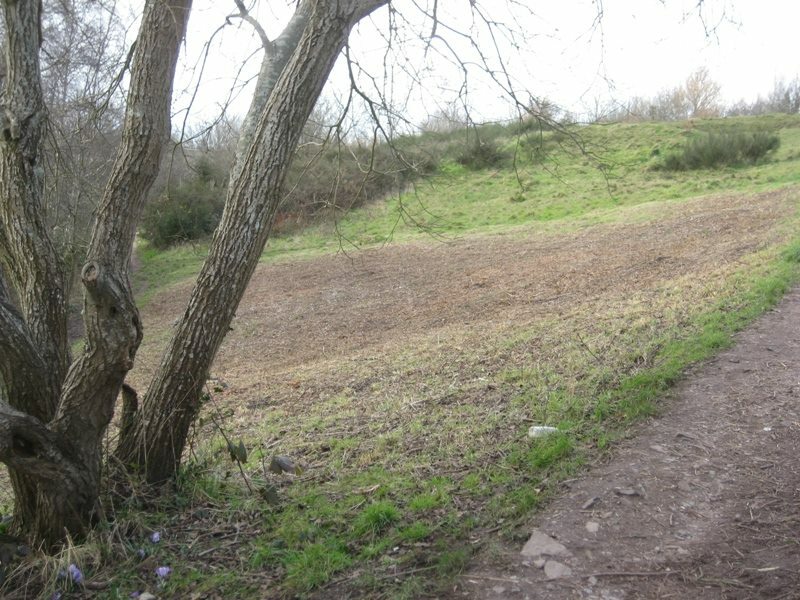 The day-to-day management of Troopers Hill is undertaken by Bristol City Council's 'Parks and Estates Service', often refered to as 'Bristol Parks'. Troopers Hill had a dedicated park keeper, Julian Thomas from mid 2006 until September 2014 when he left Bristol Parks. Julian's duties have now been taken over by other members of the team under the Area Team Leader (ATL) who in turn reports to the Park Manager for our part of the city. It is important that there is an element of discretion in the level of maintenance carried out on the Hill to ensure that it maintains its natural feel and does not become overly formalised or manicured. While some work, such as keeping paths clear, is carried out during the summer much of the work to keep the scrub under control has to be done during the winter when there are no nesting birds. This 'winter work' can seem very harsh but it is necessary to protect the hill's unique habitat. Photographs of some of the work carried out be Bristol Parks in 2015/16 can be seen here. 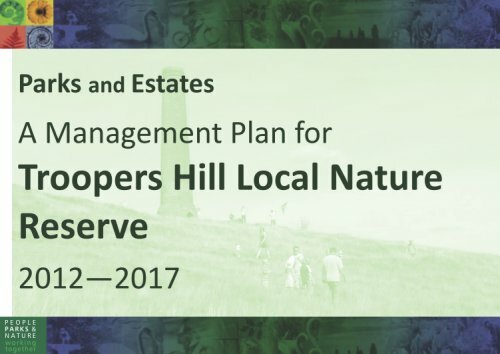 The Council's Nature Conservation Officer (NCO) has responsibility within the Council for providing ecological advice and promoting Troopers Hill as an important wildlife site in Bristol. Friends of Troopers Hill assist in managing Troopers Hill for wildlife at our monthly Work Parties. The work we do is in accordance with the Management Plan and agreed with Bristol Parks before hand. Generally we undertake tasks that are very labour intensive and can't be done with powered tools. For example whereas Bristol Parks might clear a large area of bramble in the winter we cut it in areas where is is growing amongst broom or heather. Several members of Friends of Troopers Hill have been trained by the Council so that we can lead work parties while being covered by the Council's insurance. Friends of Troopers Hill also raise funds or provide volunteer time to enable other organisations to be brought in to assist with managing the site. An example is the work to manage the gorse by Community Payback described below. We are also keen to welcome groups from local offices who can work on Troopers Hill as part of team building exercises or would just like to give something back to the local community while having a great day out. If you are a member of a group or represent a company who would like to visit to work on Troopers Hill, then please see our information sheet for Corporate or Group Volunteering (pdf) and get in touch, we would be pleased to see you. For example 17 volunteers from Lloyds Bank gave their time to help make a difference on Troopers Hill in October 2014 and we were pleased to welcome volunteers from from the Biodiversity team at DEFRA in April 2012. 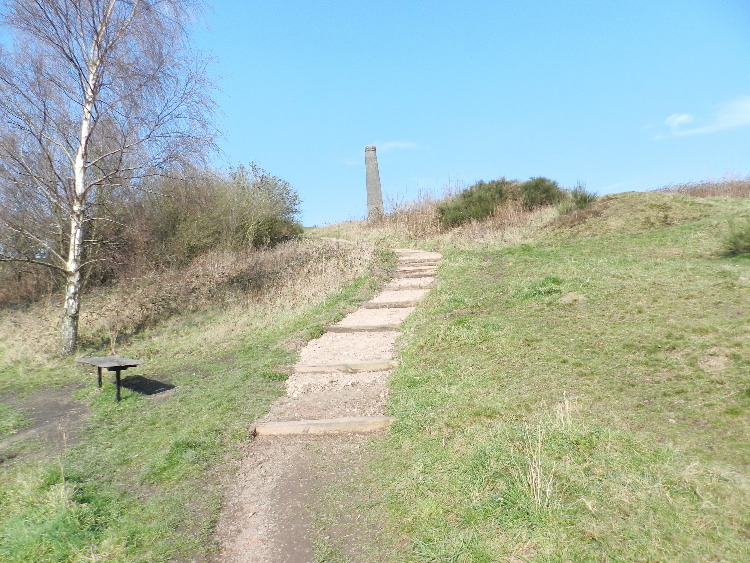 Troopers Hill is very popular with dog walkers. Many also help keep Troopers Hill looking its best by picking up litter and other people's dog mess. Along with all Council managed parks & green spaces in Bristol, Troopers Hill (including the Field and the Woodland) is currently designated in the Council's 'Dog Control Orders' as an area where dogs can be exercised off lead, there are no plans to change this. A report on this subject published in the Week In in August 2016 is shown here and in the image above. As well as helping to ensure that Troopers Hill LNR is well managed for both wildlife and people, the 2007 & 2012 plans were written to support entries in the national Green Flag Award Scheme. Troopers Hill was awarded a Green Flag each year from 2007 to 2013. A flag pole was errected at the Greendown entrance to fly the Green Flag. Bristol City Council is no longer entering sites in the Green Flag scheme, but instead Friends of Troopers Hill enter the site in the RHS Britain in Bloom South West Parks and Open Spaces award scheme. As for the Green Flag scheme this award requires an assessment of the management of the site by an external assessor but is more focused on community involvement. Troopers Hill received the top award of five stars three years in a row following a 'Gold' award in the previous year. While the RHS scheme awards a certificate, there is no flag awarded. In 2015 Bristol City Council provided a flag to fly at Greendown to celebrate Bristol's year as European Green Capital. In March 2016 Friends of Troopers Hill replaced this with a 'Welcome to Troopers Hill' flag. The flags become tatty over time so when these reached the end of their life, we intended to ask Bristol City Council to remove the flag pole; but we were approached by local families who liked the flag asking if it could be replaced. As a result with the help of Natasha (one of those who had contacted us) Friends of Troopers Hill ran a crowdfunding campaign in November 2017 which raised sufficient funds in only 2 days to buy a replacement flag and a spare. While Bristol City Council funds the regular maintenance through its revenue budget it has very limited funds available for improvements or capital funding. 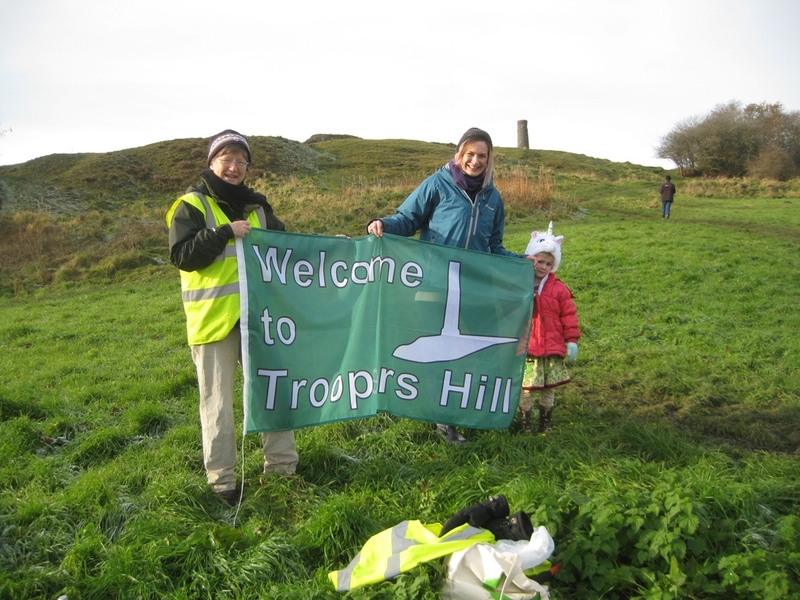 Friends of Troopers Hill have been very successful over the last few years in raising grants for work on Troopers Hill - details of some of the work done prior to 2012 can be seen here and more recent works are described below. Our Funds page has details of all the grants we have been awarded. As can be seen below, Friends of Troopers Hill (working with Bristol Parks) have carried out or facilitated a lot of projects over the last few years. However, there is always more to be done. Following discussions at our meetings, we developed a project in 2017 which addresses our current priorities. • Increase visitors' knowledge of the Hill and its importance for wildlife in the city. The project includes production of a new Management Plan for 2019 - 2029 as described at the top of this page. We are delighted to have received support for this project from a range of funders. Safety of pedestrians using the entrances to the Hill from Troopers Hill Road had been a concern of local residents for many years, particularly due to poor visibility for those leaving the site. 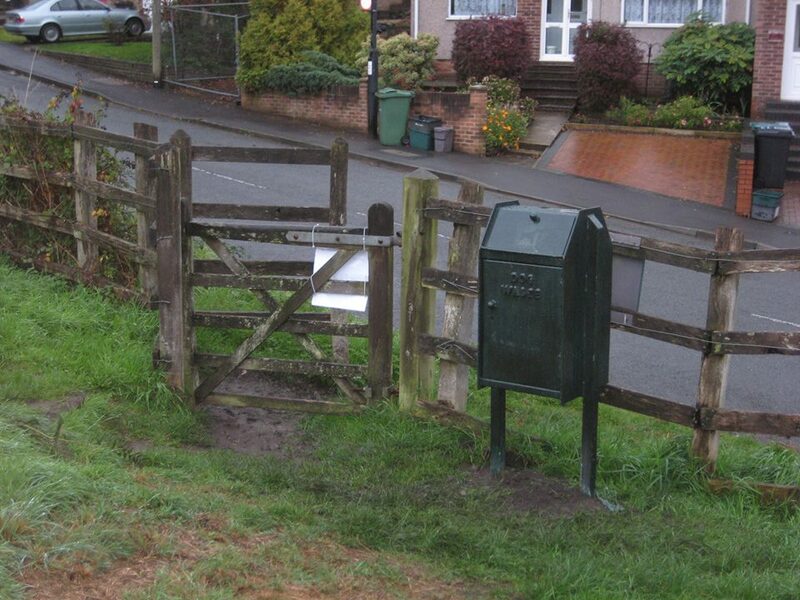 Work to improve the entrance at Greendown was carried out in 2009. The Council have now constructed build-outs to give short lengths of footway on the Hill side of the road at the two entrance locations with the worst visability. 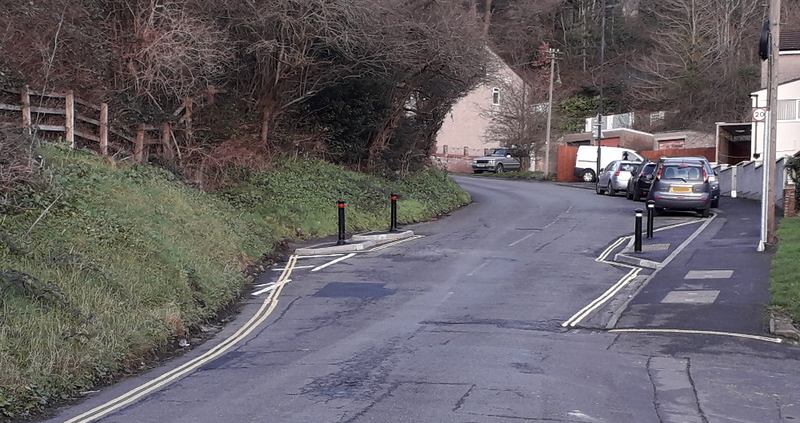 The work also included improved pedestrian crossing points near the entrance to the Hill at the junction of Greendown and Troopers Hill Road. At the same time they constructed other safety & speed reducing measures on Troopers Hill Road - speed cushions and a speed table. In December 2016, a new geology interpretation board was installed at the top of the hill near the chimney. Funding for the board was provided by Bristol City Council as part of a project to help promote greater enjoyment and understanding of Bristol's Local Nature Reserves, and The Geologists' Association though their 'Curry Fund'. As the path through the woodland that forms part of our Woodland Trail leaves the nature reserve and enters the woodland there is a marker post and adjacent to it a bench. This is the location we call 'Little Elizabeth's View'. The first bench here was one of three benches installed in June 2006 and the only one to survive that year. Sadly after 10 years good service the wood had rotted and the bench had to be removed. The other two benches were replaced in 2008 with metal benches with wooden tops. 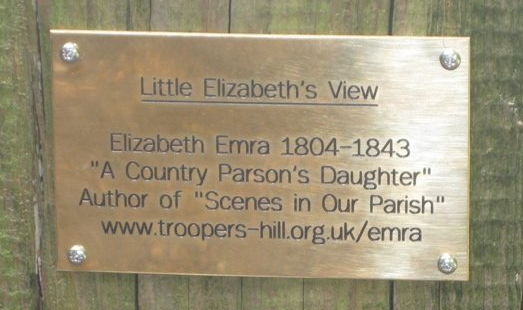 Friends of Troopers Hill launched an appeal in 2016 to replace Little Elizabeth's bench and raised sufficient funds for a metal replacement to be purchased. 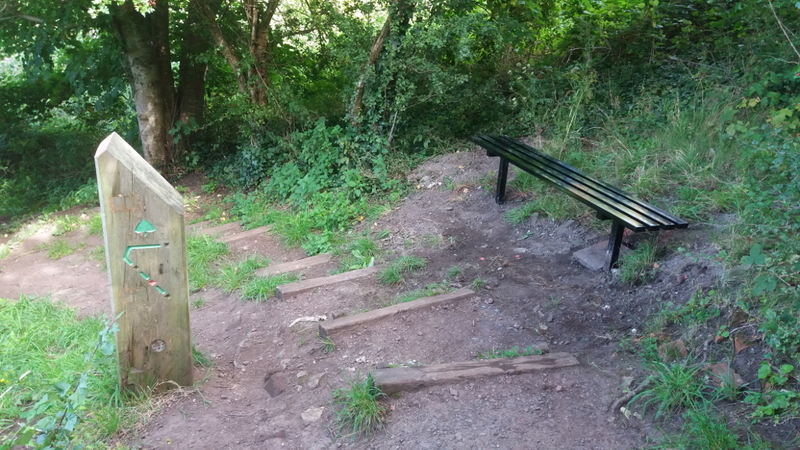 The new bench was ordered through Bristol Parks and installed in August 2017. Some of the funds for the replacement bench came from a donation from the ALHA which was given as a thank you for our members leading a guided walk for them. We later learned that ALHA were making a further donation of £50 and agreed with them that this should be used to install a small plaque on the marker post with a reference to Elizabeth Emra. 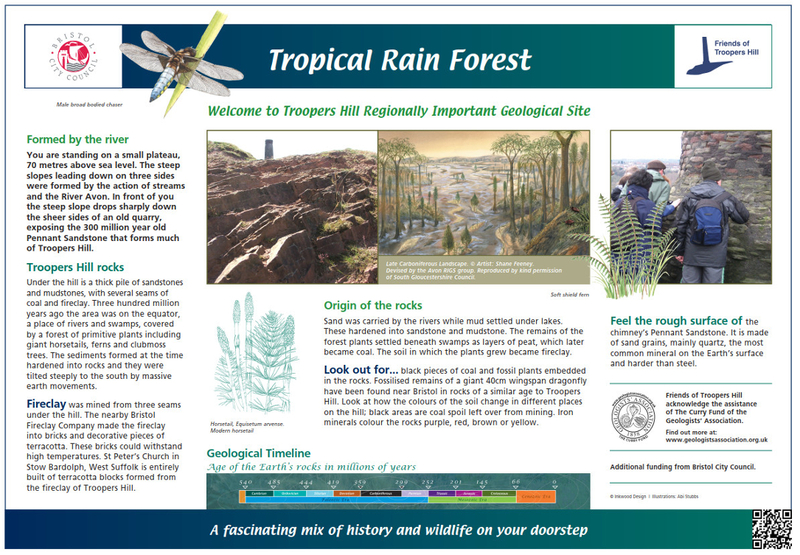 Projects carried out on Troopers Hill Field (which forms a gateway to the Local Nature Reserve, but is not covered by the Management Plan) can be seen on our Troopers Hill Field Page. 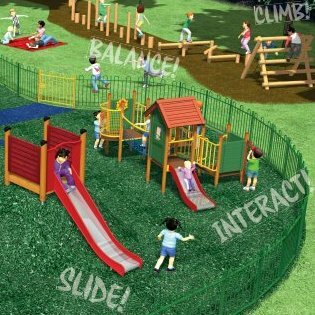 These projects include the construction of a new Play Area in September / October 2016; tree planting in 2011 & 2016 and improvements to the entrances. 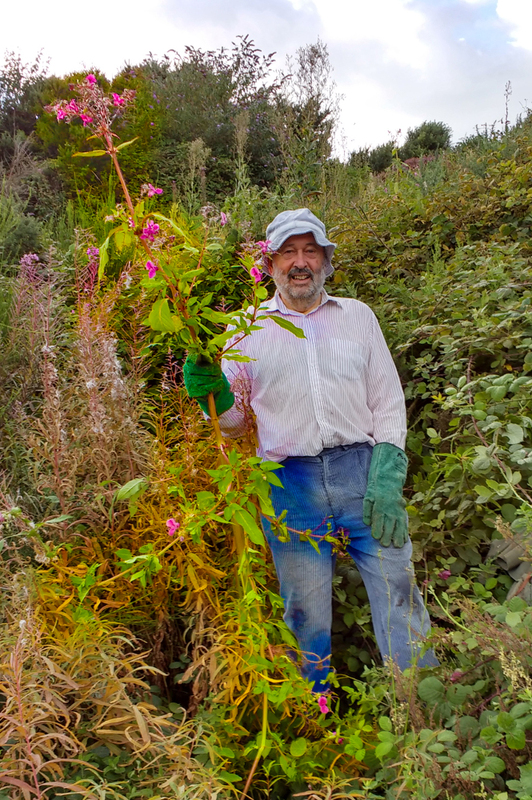 The pretty plant being held in the photo is the nastily invasive Himalayan Balsam (it is an offence against the Wildlife and Countryside Act to spread it). We spotted some Himalayan Balsam growing on Troopers Hill in August 2016, it was amongst rosebay willowherb, which made it more difficult to spot. We have told Bristol City Council of its presence and quickly organised a bash to deal with it. It is relatively easy to control - no chemicals needed, it's just pulling it out, crushing or slashing it before it seeds. We have cleared the area concerned and will now monitor the area and pull any that reappears. This is the first year we have noticed the plant on the hill, though it may have been there in past years but hidden by the willowherb. There is a lot of it in the adjacent Avon Valley. As mentioned above dog walkers are major users of Troopers Hill and bring many benefits, unfortunately some people do not pick up and as a result dog mess is the biggest complaint raised by visitors to Troopers Hill. We have tried to address in various ways - see our Dog Fouling Clear Up page. One important aspect of this is to provide sufficient dog waste bins. 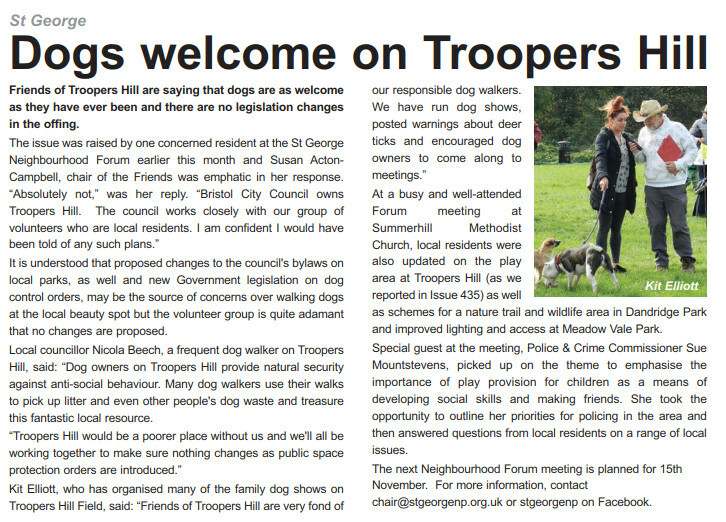 When Friends of Troopers Hill was formed in 2003 there were no bins on the Hill and only two dog waste bins on Troopers Hill Field. Over the years we have worked with Bristol Parks and St George Neighbourhood Partnership to add more bins and to ensure they are emptied regularly. Donations from dog walkers in 2010 helped fund one of the litter bins on the Field. The 2007 Management Plan had set a target of having a dog waste bin at every pedestrian entrance. This was finally achieved in 2015 with the installation of an additional bin at entrance E on Troopers Hill Road (see photo). At the same time an old bin on Troopers Hill Field was removed and replaced with a combined litter and dog waste bin. The provision of these bins was made possible by the Bristol Parks Forum project to install recycling bins in Bristol's parks in Bristol's year as European Green Capital which released the old bins for use elsewhere. There are now three combined bins on the Field and a dog waste bin at each of the five entrances to the Hill. Each of these bins are emptied twice per week. Along with Bristol Parks we will continue to monitor the use of the bins but we believe that after 13 years we have now reached the optimum number for the site. 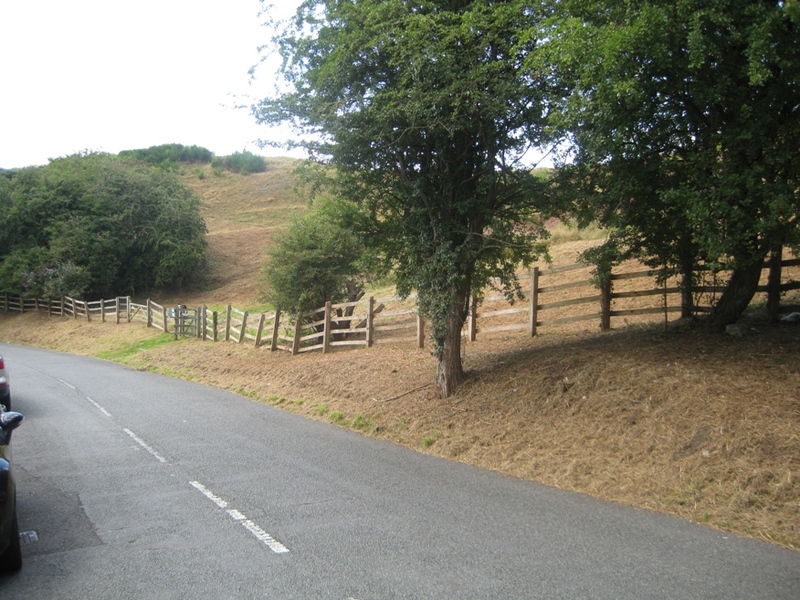 Working with St George Neighbourhood Partnership we were pleased to be able to bring Community Payback back to Troopers Hill in the September & November 2014 to continue help us manage the area of gorse in the central area of the Hill (compartment 5). Their previous work in March 2012 is decribed below. 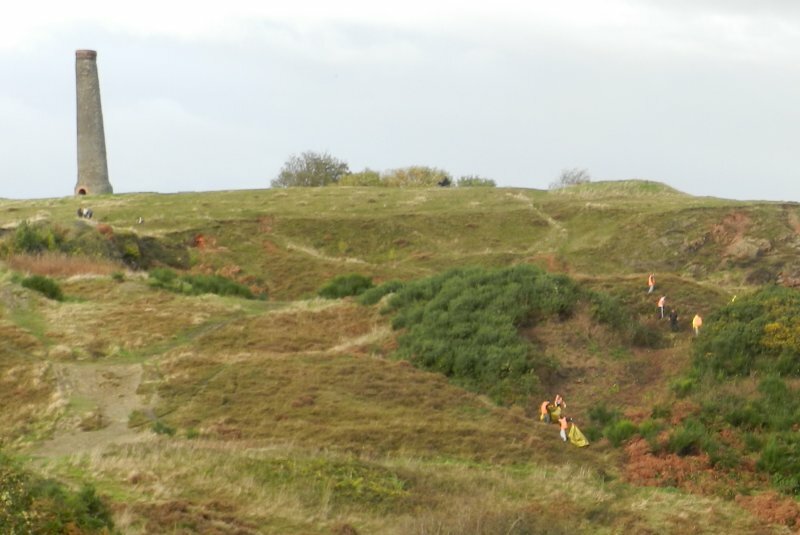 This work re-established a fire break between the two main areas and will help prevent its spread into the heathland. They also removed a lot of other scrub, including buddleia; oak, hawthorne & siver birch saplings and a lot of bramble. Photos of the work can also be seen on the Payback team's twitter account at twitter.com/BGSWPayback. Aim 6.2.5.1 of the Management Plan is to maintain the two listed chimneys in line with the results of regular inspections. In September 2012 both chimneys were inspected and as a result further work is being carried out as described below. Work was carried out in May & June 2013 to repoint the chimney and rebuild the top section where some stones were loose. The old road signs were temporarily removed so that they could be refurbished; they were replaced in August 2013. In February 2013, steelplejacks from Highline Rope Access Services working for Bristol Parks carried out a further inspection of the top chimney and cleaned off some of the growth of grass and moss at the top. Following this inspection the Council decided that due to a small risk of loose stones or mortar falling inside it was necessary to prevent people going inside. Work to repair the stonework was carried out in Autumn 2013. 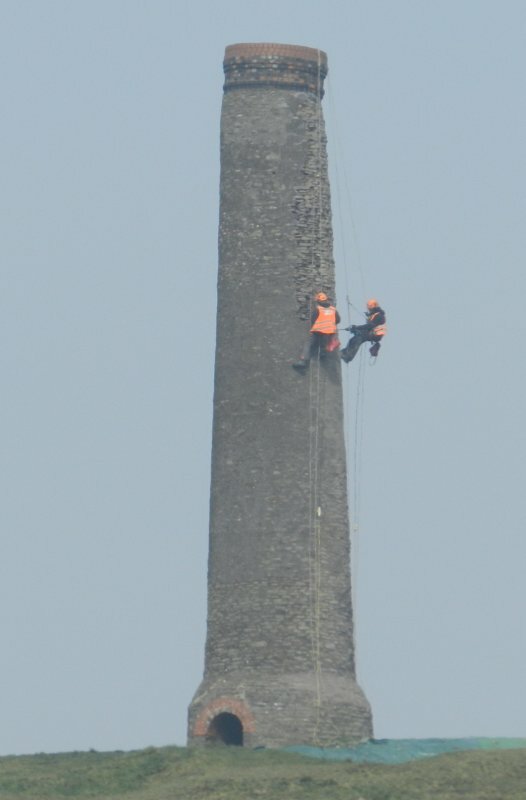 The inspections also showed that some work was required to repoint the outside of the chimney, the first phase of this work was carried out in March / April 2014 using rope access. The final phase was carried out from October to December 2016. This work was of lower priority as it aimed at preserving the chimney in the long term rather than addressing an urgent safety issue. Friends of Troopers Hill have been awarded over £30,000 of funding by Groundwork UK from the Big Lottery through their Community Spaces Programme. The project is improving access to Troopers Hill and will encourage visits from groups such as 'Walking for Health'. The work is being carried out throughout 2012. The application was in accordance with objectives 7.2.10.4 & 7 of the 2007 Management Plan. The project page has full details of the work carried out which included improvements to the steps, new interpretation boards and waymarking in the adjacent woodland. As part of our 'Stepping Forward' project (see above) offenders on the ‘Community Payback’ scheme have carried out some work to the woodland paths. We were also able to fund them to do some habitat management work on Troopers Hill. 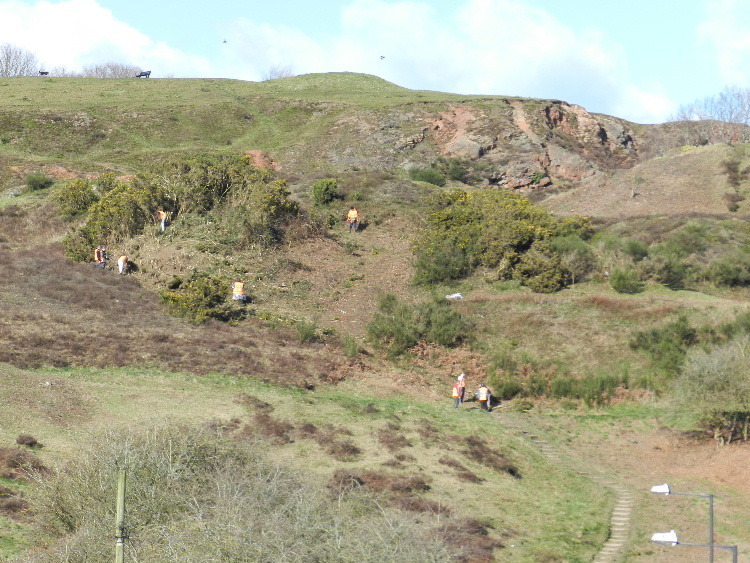 The Payback team have carried out work to remove part of the largest patch of gorse. Some gorse will be allowed to regenerate in this area before further areas are cleared in future years. Removing this gorse by hand is hard work, especially in the rain. In larger areas of heathland, such as in Peak District in Derbyshire it is controlled by fire, but this is not possible on Troopers Hill. This work certainly showed that Community Payback is not a soft option. You can read more about the reasons for managing the gorse on our Forum here and this posting will help you identify it. The Photographic Survey that has been carried out since 1994 shows how the gorse has spread - see photo No 20 in particular.